Here is how we pressure wash hardiplank and wood siding in Houston,Tx. When our professionals at SMC Cleaning Services arrive at the job site, we walk the perimeter of the house to get a measurement of the property. This is so we can give a price to the home owner up front before we get started. And, to find any hidden obstructions or obstacles that might give us problems. Then, we move any lawn furniture or plants that might be in the way away from the house. The equipment that we use is a Pressure washer (4Gpm @ 4000 psi), 24 ft extension wand, and a downstream injector on our pressure washer to apply soap through spray wand. You also need a quality house washing detergent and a 24 ft extension ladder for those hard to reach high places. You also need at least 150 foot of high pressure hose to reach all the way around the house. When laddering a house, make sure you use the proper climbing angle. The preferable climbing angle for pressure washing in Houston is a 75 degrees angle to avoid falling. For professional pressure washing in Houston, Tx call SMC cleaning services at (281) 899-0402. 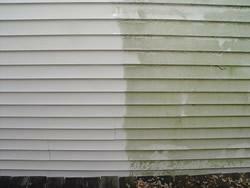 The important reason for pressure washing the siding of your home is to remove mold and green algae. Before applying the chemical on the siding, spray down the plants and grass by diluting it with straight water. At SMC Cleaning Services, we only use biodegradable green chemicals. When getting started pressure washing, spray the solution onto the siding. We do this by starting at the bottom and work your way up to the top. When rinsing off the chemical, pressure wash the siding from the top first. Then, work your way down to the bottom and be careful not to spray pressure underneath the siding to avoid damaging it. Always be careful and look out for wasp nests when pressure washing the eaves of the house to avoid being stung. Always try to back off and use minimum pressure when washing around windows and doors to avoid leakage. Once completed pressure washing, move all plants and lawn furniture back in place before leaving. So, for pressure washing in Houston,Tx call SMC Cleaning Services at 281 899-0402. You can also fill out form below for free quote.